Over the last week we have seen some major changes in our little man. No he isn't starting to crawl or read The Times each morning - it isn't that drastic - but we can see that these last few weeks (and this last week especially) have been a growth spurt for him. It seems common knowledge (though, it wasn't to me!) that at around 12 weeks, babies have a growth spurt. It's quite a big one too, as it is roughly when they're 3 months old. If Jake had been born on time, and not 2 weeks late, he would've been 3 months old yesterday (13 weeks). 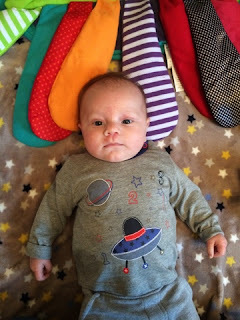 It isn't clear whether or not the 12 week growth spurt is from birth or due date - I'm going to go with due date because Jake has definitely had one this last week or so. So what have we noticed?.. The big thing I've noticed is his size! 0-3 month clothes aren't swamping him now; he's filling them out and his feet and hands especially seem so much bigger. He's also changed in the face - more rounded and he looks a little more like his dad again. Jake can now roll on to his side, but not his front. He still dislikes tummy time, but can last for 3/4 minutes before the frustrated crying starts! He's now able to hold his head up well and sits well with us acting only as guides really. Another development is that he's able to hold things more firmly, and we caught him holding his starter teether, toy book and fleece comforter - all by himself and attempting to chew them! His infantile eczema on his face is clearing up nicely, and although he still suffers from redness (made worse by the teething, I think) it really is just his strawberry marks from birth that stand out now. Feeding has also changed, he now takes 7oz of formula 6 times a day and has managed to sleep through the night a few times. We've had the Wonder Week leap 3 and leap 4 is due for late December. I wonder what amazing changes that will bring? Has your little one changed this week?